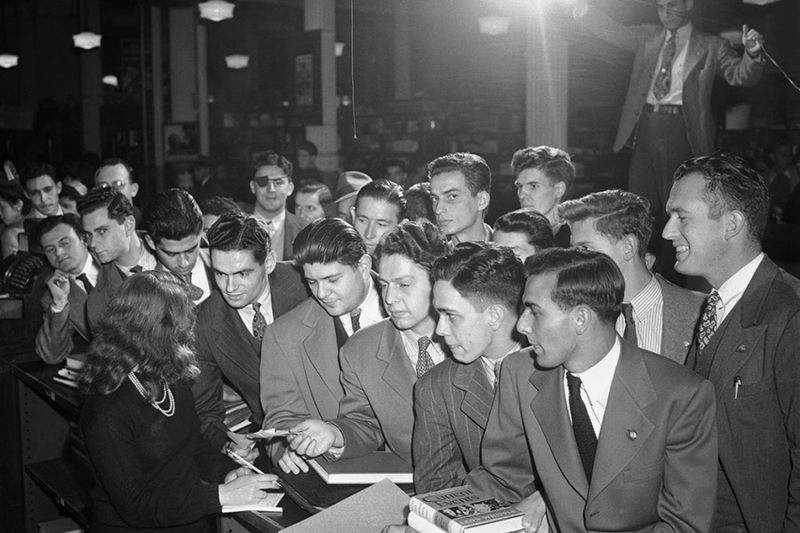 The GI Bill opened the doors to college to returning World War II veterans, including many from immigrant families. They joined the professional class and became further integrated into American society. In a state where 60 percent of schoolchildren are Hispanic, and the legislature is overwhelmingly white, the words “those kids” have meaning. “It’s not hard to figure out that when people say‘those kids,’ it’s a euphemism for African-American kids, Latino kids, Native American kids,” Mr. Rhoades says. “We have been systematically disinvesting in higher education, and that is precisely at the time when people who want higher education — lower-income kids, students of color, and immigrant kids — have increased.” As the student population has diversified, the language that many people use to define the value of a college degree has shifted, from a public good to an individual one. Is that merely a coincidence? It’s a jarring question for a sector that sees itself as a great equalizer, in a society that aspires to be a meritocracy. But look at a range of evidence, and it seems that policy makers — with the encouragement or tacit acceptance of the public — have erected barriers to higher education based on race and class. That is a difficult theory to pin down, and one not everyone believes. As federal and state governments face many financial obligations, and budgets are tight, it may be facile to argue that a decline in public higher-education funding is grounded in racism. Jason Delisle, who studies higher-education finance at the American Enterprise Institute, points to the burdens of pensions, Medicaid, and K-12 school systems, drawing a connection between increased spending there and declines for colleges. Other scholars in economics, higher-education policy, and cultural studies point to arresting correlations, though they’re subtle, shrouded in dog-whistle politics. Even in the dawn of the Trump era — after xenophobic and racist rhetoric energized the campaign of the populist billionaire — few policy makers would bluntly say they don’t want to pay for some students’ education because of the color of their skin. Yet such attitudes have been documented, says Anthony P. Carnevale, director of the Georgetown University Center on Education and the Workforce. “This is a well-known, constant theme in economics.” Studies have found that diversity is an impediment to the welfare state, of which education is part. A report by the Harvard Institute of Economic Research in 2001 concluded that Americans do not support European-style social-safety nets, including education benefits, because of racial fragmentation — and a belief that minorities benefit more from wealth redistribution. Countries like Finland, Japan, and South Korea beat the United States in educational attainment not because their people are smarter, Mr. Carnevale says, but because they are racially homogenous. And that seems to lead to broad public support for education. Working on labor and education policy for many years, Mr. Carnevale, 70, has seen that dynamic at play. “White people my age are not going to vote to educate Hispanic kids or black kids,” he says. “All the great advances in education” — like the Morrill Act to create land-grant colleges in 1862 and the GI Bill to educate veterans of World War II — “have come when there was a strong white majority.” As those majorities have diminished, the public instead has pushed through measures to limit education benefits, restricting tax revenue, for example, cutting spending, and putting constraints on immigrant students. The GI Bill is as notable for the people it helped up, including some students here at New York U. in 1945, as for those it left out. Among white veterans who turned 18 from 1941 to 1946, 28 percent enrolled in college, while among their black peers, the rate was only 12 percent. Despite barriers to higher education, national and local campaigns are encouraging more minority students to go to and finish college. But gaps persist, and as the higher-education system stratifies, black and Hispanic students disproportionately end up on campuses with fewer resources. Simply raising attainment, if even that happens, may not be enough. A nation’s fortunes grow as more of the population actually learns new skills and accumulates knowledge, says Mr. Carnevale. If we are going to rebuild our economy, he says, we have to find a way to give more students the promise of a high-quality education. 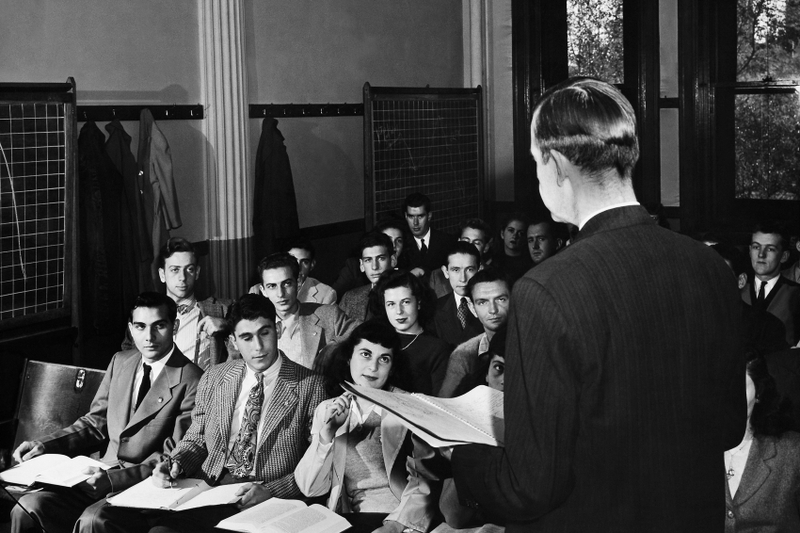 The original GI Bill, passed in 1944, is hailed for widening access to higher education. And it did expand opportunity, but only for some. In the decades before World War II, ethnic Europeans poured into the United States, and Italian-Americans in particular suffered legal and social discrimination. Like other predominantly Catholic groups from Southern and Eastern Europe, they lived in segregated urban enclaves (“Little Italies”) and tended to perform manual labor. Many white Protestants saw these immigrant groups as swarthy, dirty, criminal — a threat to the supposed genetic and cultural purity of America. As World War II wound down, with a great need to reintegrate returning soldiers and kick-start the postwar economy, Congress passed the Servicemen’s Readjustment Act. On the GI Bill, ethnic European-Americans from Irish, Italian, Polish, Jewish, Greek, and Slavic backgrounds went off to college, joined the professional class, and moved to the suburbs. The measure essentially made them white, bringing prosperity and acceptance to groups that had not enjoyed it before. But the GI Bill is as notable for the people it helped up as for those it left out. A decade before the landmark verdict in Brown v. Board of Education desegregating public schools, with Jim Crow laws and restrictions in veterans’ services, African-Americans could not take advantage of the GI Bill the way whites could. In the 1940s and ’50s, blacks were barred from attending many public universities. The historically black institutions of the day were often underfunded, with few graduate programs and limited capacity to accommodate more students. All of that choked off educational opportunities for black vets. One study shows that among white veterans who turned 18 from 1941 to 1946, 28 percent enrolled in college, while among their black peers, the rate was only 12 percent. The GI Bill also paid for job training and apprenticeships, but studies suggest that blacks were underrepresented in those programs, too. The education gap was not for lack of desire: After the GI Bill was passed, 29 percent of white soldiers and 43 percent of black soldiers said they intended to enroll in college or training. 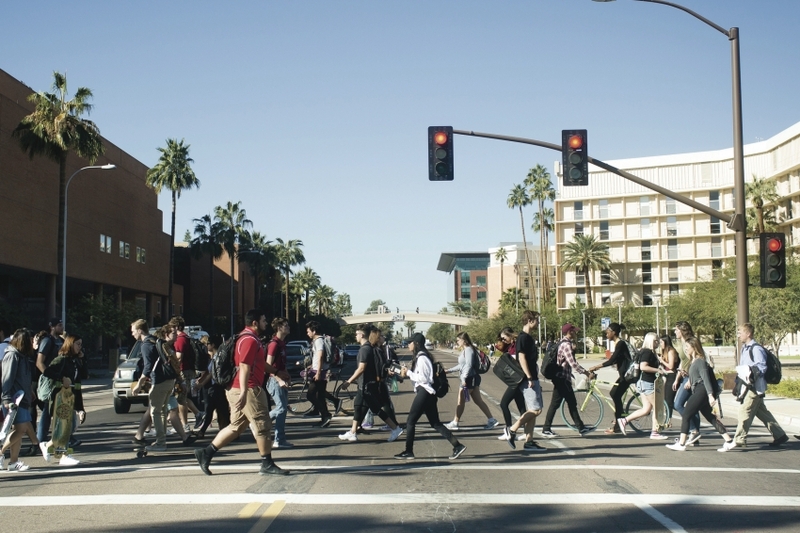 Over the course of the 1960s and ’70s, African-Americans and Hispanics started making inroads in higher education, thanks to movements that tore down legal and cultural barriers. From 1970 to 1980, the share of African-Americans with at least a four-year degree went from 4 percent to 8 percent, and among Hispanics, 5 percent to 8 percent. Some of that progress eroded in the ’80s, when Ronald Reagan became president. He saw students as freeloaders and “tax eaters,” much like unemployed parents on welfare, says Devin Fergus, an associate professor of African-American and African studies at Ohio State University. In a forthcoming book, The Land of the Fee: Hidden Costs and the Decline of the American Middle Class (Oxford University Press), Mr. Fergus lays out how the Reagan administration — with the help of conservative Southern Democrats — cut a billion dollars out of Pell Grants and other grant aid, shifting the emphasis of government support for higher education from taxpayers to bank-based federal loans. At a time when 40 percent of black children were living below the poverty line, the move hit working- and lower-middle-class families hardest. It started a trend toward ballooning student-loan debt, and it lessened minority- and first-generation-student enrollment at elite private institutions. William Bennett, a secretary of education under Reagan, said that students who defaulted on their loans were “deadbeats” who spent their money on cars and stereos. Some of the rhetoric on the student-aid cuts was racially coded, like Reagan’s talk of “welfare queens,” Mr. Fergus says. 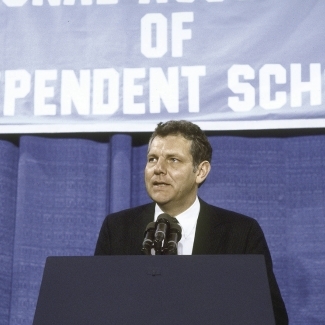 William J. Bennett, who became Reagan’s secretary of education in 1985, called students who defaulted on their loans “deadbeats.” They might have to absorb financial-aid cuts, he said, through “stereo divestiture, automobile divestiture, three-weeks-at-the-beach divestiture.” “This is dog-whistle politics,” Mr. Fergus says. “He was borrowing the language of the anti-apartheid students,” who advocated divesting in companies operating in South Africa. Reagan started a trend that was mimicked by the states. Yet what voters and policy makers did was pass a series of measures that would starve the higher-education system and effectively cut out minorities. Proposition 13, which restricted tax revenue, passed in 1978. In the ’80s and ’90s, California, like other states, focused on crime, ramping up its prison system, and those racially charged efforts would absorb money that might otherwise have gone to higher education. By the late 2000s, California’s spending on corrections would catch up with, and even surpass, its spending on colleges. Other measures further limited access. Voters approved Proposition 187 in 1994, denying education and services to undocumented immigrants, although the law was later blocked and struck down by courts. The University of California regents abolished affirmative action in 1995. In the years since, the state’s public colleges have raised tuition markedly and cut enrollment for lack of capacity. The powerhouse tech industry, rather than trying to train local students, meets its work-force needs with programmers from India and China, Mr. Murphy says. Is all of this a scheme to hurt blacks, Hispanics, and other minorities? Other government programs seem to have had such effects: Studies have shown that welfare reform has restricted public-assistance benefits more in states with greater minority populations. Drug-enforcement laws have been found to disproportionately target African-Americans, while whites use drugs at a similar rate. In looking for connections between diversity and the defunding of higher education, many see only hazy correlations. But emerging studies suggest some bias. Last year Nicholas Hillman, an associate professor of educational leadership and policy analysis at the University of Wisconsin at Madison, analyzed the balance between state appropriations and tuition revenue at more than 450 public colleges. Those that served primarily white students got more of their money from the state, while the colleges that served minority students relied more on tuition. He points to a striking, if lopsided, comparison between the University of Tennessee at Knoxville and Tennessee State University, a historically black institution. State funding per undergraduate at Knoxville, where 7 percent of students are black, is $19,500; at Tennessee State, where 71 percent of students are black, that figure is $5,600. In another study released last year, two economists — Eric J. Brunner of the University of Connecticut and Erik B. Johnson of the University of Richmond — looked at voting patterns in community-college bond referenda in California. Older white voters were less supportive of college funding than were younger voters, the study showed, and if they lived in areas with a high Hispanic population, they were significantly less supportive. In many ways, we live in Reagan’s world, with attitudes he shaped about the role of government. What might formerly have been considered a leg up often gets called an entitlement or a handout. Public higher education has undergone a financial and conceptual shift: Once an investment covered mostly by the state to produce a work force and an informed citizenry, today it is more commonly shouldered by individuals and families, and described as a private benefit, a means to a credential and a job. It’s not a conspiracy, but a neoliberal ideology, says Michael Fabricant, a professor of social work at the City University of New York Graduate Center and author, with Stephen Brier, of a new book about the disinvestment in public education, Austerity Blues: Fighting for the Soul of Public Higher Education (Johns Hopkins University Press). Does Higher Education Perpetuate Inequality? Colleges are seen broadly as engines of opportunity, as economic equalizers. Is that reputation deserved? Washington U. Is Fixing Its Economic-Diversity Problem. Its Next Challenge Is Parity. Can a City’s Compassion Remedy Educational Inequity? Meanwhile, for poor whites, the economic options have narrowed. Decades ago, manufacturing was a path to a decent livelihood, but those jobs disappeared, to be replaced by work that requires postsecondary training. This year white, non-college-educated voters registered their frustration in the presidential election. At a time when the cost of college drives a national conversation about its payoffs, policy decisions that have made college less accessible have hurt everyone, regardless of race. The country today looks different than it used to. 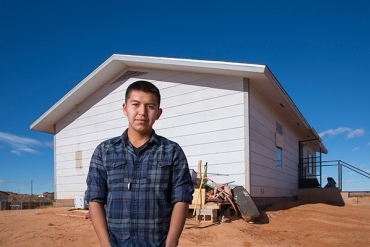 Among schoolchildren, fewer are white, and many more are Hispanic. By 2040 or earlier, America will be a majority-minority nation. If college degrees are more important than ever, could the country develop a new great advance in education that would give more people, a broad cross-section of the population, a real shot at college? Hillary Clinton might have had a solution, borrowed from Bernie Sanders, to offer free public-college tuition to students from families making $125,000 or less. Or it could have been another advantage for upper-middle-class whites, leading to “bumping,” says Mr. Carnevale, as top-tier colleges selected students with the best grades and test scores. Stratification might have worsened as less-prepared students — often black and Hispanic — found slots on campuses with fewer resources and lower graduation rates. The free-college plan is far from reality, but it now serves as a rallying point for progressives. A future Democratic candidate could resurrect it in a presidential bid in 2020 or 2024, although some observers have wondered if the party will spurn minority constituents to recapture the white, working-class vote. President-elect Donald Trump, who has branded Mexicans as “criminals” and described black neighborhoods as apocalyptic “war zones,” has yet to present his higher-education agenda. But some fear he will revive policies that have hurt minorities. The new administration may push more students toward private student loans, Mr. Fergus says, even as bipartisan commissions going back 20 years have found that the federal government provides loans more cheaply and efficiently than do private lenders. Given his aggressive talk on immigration, Mr. Trump will probably kill the Deferred Action for Childhood Arrivals program, which gives undocumented immigrants access to higher education. Mr. Trump might also revive the fortunes of for-profit colleges, some of which have been found to prey on minority students, leaving them in debt with a less-valuable degree, if any. This entry was posted in Uncategorized on November 28, 2016 by pudentilla.